Elastic and soft material, very flexible like rubber, almost odorless. Resistant to oils and grease. Resistant to abrasion and to hydrolysis. This TPU contains no plasticizers and is hypoallergenic and skin friendly. It's also resistant to microbes. 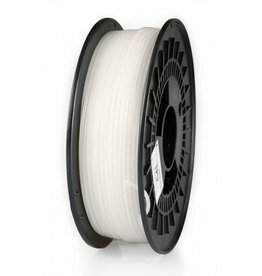 Rubber-like filament out of TPU in natural white. We recommend to print soft materials very slow, at 15-45 mm/s. The printing bed has not to be heated and the object should be cooled. The filament needs to be guided very well between feed wheel and nozzle, so that the filament does not bend. TPU is best pre-dried. For example, in an oven at about 80 °C for 2-4 hours. Drive belts, profiles, shoes or shoe soles, objects with soft touch, such as cell phone cases. Due to all the different types of hot-end it's extremely difficult to give a temperature advice. Please consider these tips, provided by the manufacturer, as a starting point to find the temperatures that work well in your setup. You may have to adjust the temperature settings slightly based on your type of printer.